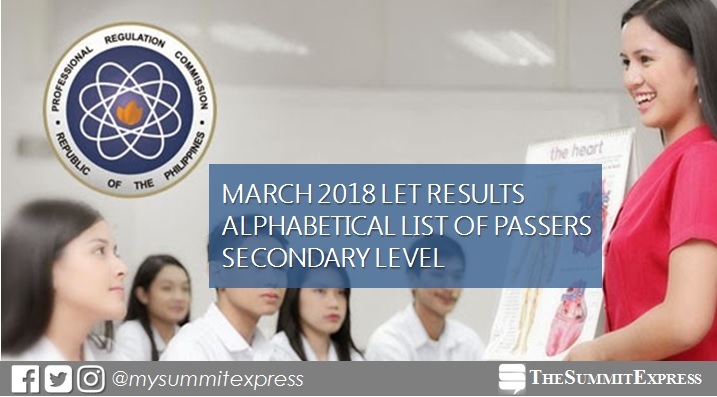 MANILA, Philippines – (Updated May 23) The Professional Regulation Commission (PRC) announced alphabetical list of passers of March 2018 Teachers board exam or licensure exam for teachers (LET) - Secondary level on May 23, 2018, or in forty (40) working days after the exam. The full list of passers or those who have successfully passed the tests will be posted on this page. Below list be activated once LET results are available online. PRC conducted the LET board exam on March 25, 2018 in at least 20 testing centers in the Philippines (Manila, Bacolod, Baguio, Cagayan De Oro, Catarman, Cebu, Davao, General Santos, Iloilo, Kidapawan, Legazpi, Lucena, Occidental Mindoro, Pagadian, Palawan, Romblon, Rosales, Tacloban, Tuguegarao and Zamboanga). Based from PRC Resolution No. 2017-1068, the target release date of March 2018 LET results is on Tuesday, May 22, 2018 or in 37 working days after the exam. The computation excludes weekends and holidays. PRC Board News, our partner website for PRC exam results also said that the results of the recent LET exam will be out online between May 21-25, 2018.
Review center owner Dr. Carl Balita hinted that next week will be the 'judgement day' for aspiring teachers. "Sa susunod na LINGGO magkakaalaman na pala! LET us pray and LET us welcome the new breed of MAESTRA at MAESTRO...."
May 22, 2018 Update: Today could be the big day you've been waiting for, aspiring teachers! May 23, 2018 Update: Today is the expected release of LET results. Good luck and congratulations in advance! Share the good news to other takers!